Okay, so we may say this every time the festival comes around, but this year's Lollapalooza is going to be the best. Ever. With a killer lineup and promises of good weather (fingers crossed! ), it's bound to be a weekend to remember. Even though we're stoked to see all the acts the music festival has to offer, we're especially excited for a few bands in particular: notably, Lana del Rey, Vampire Weekend, and the Nine Inch Nails. And since we know what will sartorially fly at the Killers show will not jive at 2 Chainz's set, we've pulled three amazing outfits, inspired by the three acts that straight up give us goosebumps. Clockwise from top left: Nine Inch Nails "Came Back Haunted" Album, $14.99, available on iTunes; Current/Elliott Shortall Overalls, $579, available at My Theresa; H&M Top, $9.95, available at H&M; Comme des Garçons Play Jack Purcell Sneaker, $125, available at Opening Ceremony; Federica Moretti Handmade Baseball Printed Wool Felt Hat, $137, available at Luisa Viaroma; Nasty Gal Star Studded Backpack, $68, available at Nasty Gal. It's true: NIN is back, and it's offering all the angst and grunge-era music you can handle. Though the only remaining original member here is Trent Reznor, we're taking this opportunity to revive all the trends we rocked while watching the group on MTV — back when it was all music videos and Beavis and Butthead. 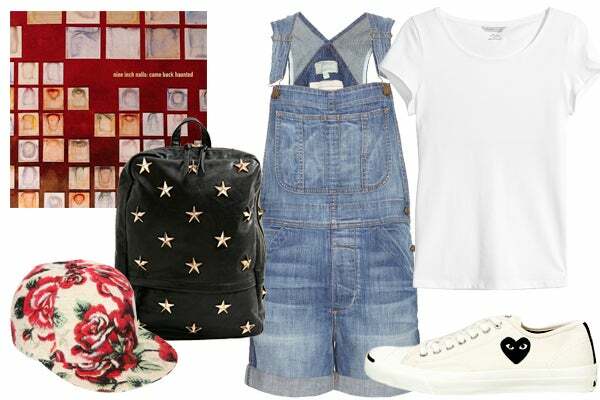 This means channeling the overalls, baseball caps, and backpacks of the '90s. It's just like the song goes: "The best thing about life (like this outfit) is knowing you put it together." Clockwise from top left: rag & bone Betty Exclusive Top, $220, available at Farfetch; Dolce & Gabbana Rose-print Crepe Circle Skirt, $1,525, available at Net-a-Porter; Lana Del Rey "Born To Die" Album, $9.99, available at iTunes; Forever 21 24-Hour Platform Sandals, $32.80, available at Forever 21; Jill Zarin Oxidized Brass Red Faceted Stone Teardrop Button Earrings, $25, available at Macy's; Linda Farrow Luxe 38 Black Sunglasses, $730, available at Mona Moore. Del Rey may have that summertime sadness, but we think this outfit would certainly cheer her up. This is your chance to join in on the singer's romantic style. The rose-printed circle skirt is the more obvious romantic gesture, here, but the subtle lace detail of the crop top makes for a perfect pairing. Doing up your hair real big, beauty-queen style is optional, but encouraged. 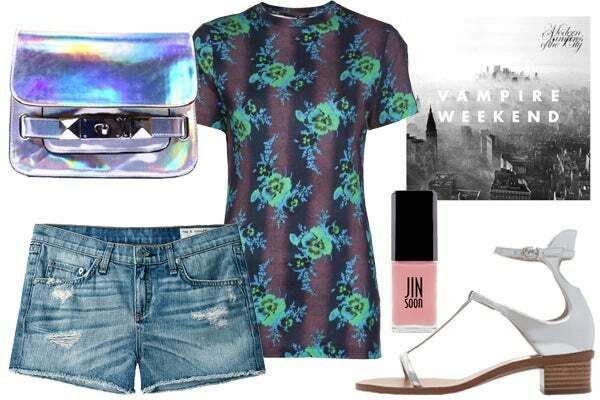 Clockwise from top left: Akira Black Label Hologram Cross-Body Satchel, $44.90, available at Akira; Christopher Kane Bouquet T-shirt, $308, available at Farfetch; Vampire Weekend "Modern Vampires of the City" Album, $9.99, available at iTunes; Zara Patent Sandal, $29.99, available at Zara; Jin Soon Tea Rose Nail Polish, $18, available at Jin Soon; Rag & Bone Cut-off Short, $154, available at La Garçonne. Though Vampire Weekend only began a mere seven years ago (making them relatively new to the music scene), these preppy indie rockers have made quite the impression. And for us, they're one of our must-see acts at Lolla. We recommend staying on the "indie" end of preppy indie, however, with a contemporary, totally dance-friendly outfit. We're in love with silver shoes at the moment, and pairing them with cutoff shorts that will keep you cool. The subtle pop of nail color is just the cherry on the sartorial sundae.